Home/ATP Masters 500/Halle Draw 2016: Will Federer Defend His Gerry Weber Open Title? 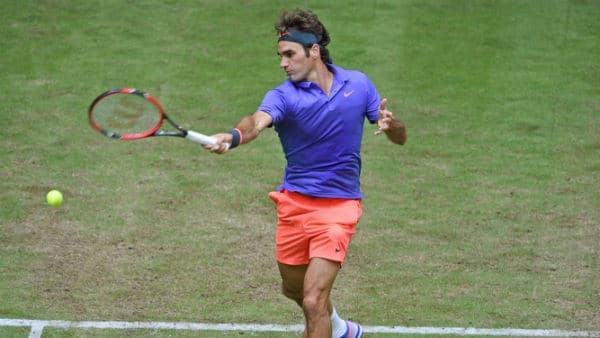 Halle Draw 2016: Will Federer Defend His Gerry Weber Open Title? First up is the German Jan-Lennard Struff whom Roger has never played before. He could have faced him in his opening match in Halle in 2014 but instead got Sousa. Struff is in the Top 100 but has no wins against Top 10 opposition and it should be plain sailing for Fed. Round 2 is either Jaziri or Berankis. Again neither player has much pedigree on grass and I can see Fed winning easily. Jaziri took a set off Fed in Dubai in 2013 but you can't really read much into it and Roger's first 2 matches are peRFect really to get some match practice and fitness in the bag. The quarters is then seeded to be against Goffin who had a pretty decent French Open making the Quarters. He's a great mover / ball striker but has no power and on grass it's tough to get away with that. Kudla is also in that section and at Challenger level he's proved he can play on the surface so you can't rule him out. For the semi finals Berdych is in Roger's half as are Dustin Brown, Troicki and Zverev. I could see any one of those guys coming through that section. Berdych of course has a Wimbledon final to his name but since 2010 he's only managed one Quarter Final at SW19 and isn't in great form. I'd like to see Brown come through as he's so good to watch whoever he plays so if you put him up against Fed it could be one to watch. As for the final Nishikori is the top seed and he doesn't really have too many opponents in his half to really trouble him. Kohlschreiber has made the finals in Halle before so he's probably the biggest threat. Thiem is in there too (are there any tournaments he doesn't play???) along with Ferrer but he doesn't really factor on grass. Expectations? I think Fed should make the final with this draw. What do you guys think? Sweet! My first career title and its at an ATP 500 series event, not bad! Haha. I will update the leaderboards after Halle! Yeah – I think finals is a fair expectation after today. From the last thread…From comments it seems folks had fairly high expectations for Stuttgart. Fed was hoping to make the semis apparently. The GOAT will be back. I predict finals in Halle and close to match fit! Yeah agreed. I don’t think Thiem beats Fed in form on grass either. Bit annoying he managed it yesterday though but wasn’t like he got outplayed, just didn’t have that edge on the key points. I think that high volley error on match point cannot be considered an error. Federer was in a compromising position. Even if he had got the ball in, no way it would’ve been a winner, and Thiem would’ve had plenty of time to put the next shot away. Don’t forget that Thiem was up 5-0. All fair. I think Federer wins Halle. Interesting take on that mp Sid, thanks for your insight. thanks Alb. I sure feel the same about our Maestro. Watched that point again. He did have plenty of time, and all options available, and down the line would probably have won it. So would the lob, had Thiem let it drop, and chased it. Remember that almost vertical lob over Karlovic, at Indian Wells I think to win Set 1 or something? Yeah Fed lobs Karlovic for fun, did it at AO too. But the lob, yes, that one could have been much better. If Sid thinks Fed takes Halle, then he will! How much $ you putting on it? I ll forget the match in 20 mins like Fed quotes it. He s fit and running , obviously needs more matches to fine tune his game , but 5 matches in Halle could be an added bonus here (a good decision to play back-to-back grass tournys). He ll be fine and yes like Sid said – I am backing Federer to win. Federer for 9th Halle title ! Fed needs to build more match stamina imho & with this draw it looks like he’ll have the opportunity to do that. Not sure we can say Thiem ‘doesn’t Factor on grass’ anymore! Don’t think I’m very anxious to see a rematch so soon though. Of course that doesn’t mean I don’t want Fed to make the final! One match at a time. See how he does at Wimbledon I guess. I would say 4th Round maybe. Groth should have taken it 3, Youzhny and Federer both should have beaten him but he’s found ways to win. Must be high on confidence after RG though even though he got mauled by Djoker. I’ll be happy if he makes the semis. If I were him I’d be looking to get back to looking really sharp by the 2nd round of Wimbledon. I think he has to go one better than Stuttgart now. Finals! I think Roger has a shot at thr title, its all in his racquet! When they had the usual poll on MTF asking what would be Fed’s first tournament win of the year, I for some reason said “Halle” – couldn’t work out why I was discounting Dubai. That of course was *before* the injury 🙁 I’m hoping I’m right, regardless, because I think he really needs the matches. Jon, what do you mean about Kei being top seed? Am I missing something?! I think J means – top seed “in his half”. Yeah I mean top seed in his half of the draw and projected to face Fed. Not sure what to think after the way he bowed out in Stuttgart but no complaints because more Roger on grass is a win win situtation. Would love to see Brown in the mix, he is a blast on this surface! I don’t believe Fed’s loss to Thiem came down to rust or whatever like a lot of others in the comments. Only thing is the timing that is missing. Lost count of the amount of FHs he sprayed but all to be expected. Really hoping Fed can make the final here, gonna be crucial to set things up for a decent Wimbledon. Yeah timing and shot selection not quite on the money. Brown is quality, surprised he didn’t play Stuttgart but was in Surbiton instead. You don’t think timing is a rust issue? I do yeah, can’t not be. It is of course but it would’ve been an issue regardless if Fed had or hadn’t played the FO because it’s his first tournament on grass. Every player has to go through it around this time of the year. I hope Federer wins Halle. Great to see him back in form just in time for Wimbledon. Federer vs Brown would be a hilarious fest of shotmaking. Let’s hope it happens! I agree with the more measured comments here. Match point aside, Fed actually got plenty of practice on grass (and Stuttgart is fast conditions; anyone can win a match because it’s all down to a few points here and there), and I was happy with his improvement over the week. Besides, Thiem is a very good player right now, and if fed is gonna lose to someone, I don’t mind it being him. If I were Fed, I’d hate that match up, but I guess it’s not at a slam so it’s all good. Yeah although i think Fed is usually good at countering players that play a little unorthodox. Struff isn’t bad, might be extra motivated on home soil to up his level like Kohli always seems to. I’m not feeling as optimistic as some people. Don’t know why but it feels like it will take Fed a while to get back in the “groove”. Hope I’m wrong. The Stuttgart final is rained out so they’ll have to resume play on Monday. The loss may have been a blessing in disguise since Federer would have had to play for like five days straight and then go right to Halle if he’d made the final. Given that Federer hasn’t fallen short of the final in Halle since 2002, and that he won the title even in his worst year, 2013, I’d have to say that a loss before the final would be a huge shock. But I think he has a good chance at the title there. His losses in the final have been to great grass-court players (Hewitt, Haas) and I don’t see anyone of that caliber in the draw. Now that he’s got some grass-court matches under his belt, he should be able to iron out the kinks in his game fairly quickly. Go Roger! Yeap blessing in disguise, I dont have to feel so sad now. Not worth getting into 2 day match for 250 tourney. Too bad for Kohli and kudos to Thiem, give him another 3-6 months he can be a strong contender perhaps. If anyone’s looking for a good laugh. I haven’t laughed this hard in a while. I’m sure most of you will have seen Josh’s impressions, but this compilation is just golden! Yes, I think so too, although he was less audible in that one anyway. His second one of Fed about hair was better actually, commented before I’d got that far. Federer just need time to get back on his feet.. but hopefully he can rise back before wimbledon..
Winning titles on all three surfaces in the same year. Federer way ahead of the field. I noticed that, too. Those sort of stats are also things which need to be taken into account in discussions about the GOAT, if we have to have one. Halle has switched to 100% rye grass like Wimbledon. Slower and higher bouncing. So, Roger not on tomorrow, so I guess that means Wednesday? Does it usually take 3 days to get through round 1? I see Nishikori is out. Wonder who’ll get through on the other side of the draw? Have to imagine Thiem or Kohli, right? No Dustin Brown after today tut. Either way Struff had some beautiful hits. Fed raised his arms after match point like he was really grateful to get through. ATP Writes article with headline of Roger “Moves into QF” while he has to play one more match for that…Then Article heading as “Federer Wins Again in Halle” which sounds like Title Match….I wonder no one really look after these stuffs…I wonder..
How to know the number of matches FED lost after having match points? I really doubt we have site with those kind of stats…May be some other know…Its usually some one tweets these stats when that kind of thing happens like match against Thiem.. One thing I remember was that was 27th match he lost where he won more points that Opp. 2000 – Henmen 2 (Vienna SF). 2001 – Rafter 1 (Halle QF). 2002 – Haas 1 (Australian Open RD of 16). 2003 – Albert Costa 3 (Miami QF). 2005 – Safin 1 (Australian Open 2005), Gasquet 3 (Monte Carlo QF). 2006 – Nadal 2 (Rome 2006). 2010 – Baghdatis 3 (IndianWells RD of 32), Berdych 1 (Miami RD of 16), Djokovic 2 (US Open SF), Monfils 5 (Paris SF). 2011 – Djokovic 2 (US Open SF). 2013 – Berdych 3 (Dubai SF). Total 14 Matches, 31 Match Points. Found the stats… But it’s pretty disturbing that my IDOL keeps doing this to me over the years… nightmare situation to see him moving 0-5 to 5-5 in 2nd set and then lose 3rd set…. Those final set losses throughout his career especially during Winby time haunt me to no end..I still remember the 2008 and 2014 losses more vividly than his 2009 win. I can barely remember 2014 loss now, all I can picture is that comeback from 5-2 or whatever, that forehand up the line when Djoker slipped but still made the ball. Epic. 2008 is memorable because it was dark and the 2 passing shots from both of them in the breaker. 2009 I can remember loads. Roddick volley, that drive volley in the decider from Fed, Roddick shank. Such a good match. I think that the final will be against Thiem. I really miss the clock showing local time. Has Rolex not qualified?